You know what the first thing I said to myself this morning was? "I'm going to bed early tonight". And now here I'm am at 11:20pm NOT in bed asleep. Sometimes it really amazes me how much I can get done in an evening. 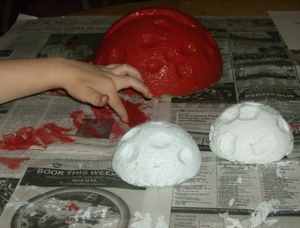 Tonight my son (me) had a science project to complete. 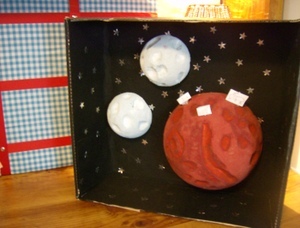 We had to make a diaroma of Mars. I completed it along with all the regular nightly duties: cooking, bathing, cleaning, bed. I also washed two loads of laundry and packed a bag for my hubby who may be going out of town tomorrow. Whew, good thing I have lots of energy, yeah right. And now everyone slumbers peacefully, the house is quiet except for the tap tap tapping of the keyboard as an exhausted, restless mama blogs about her day. But I am definately going to bed early tomorrow night. 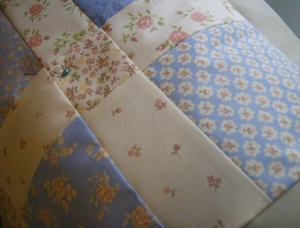 Here's a peak at my current sewing project. 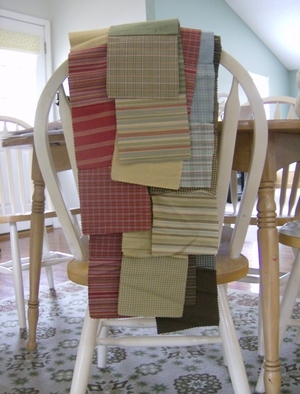 Another set of Disappearing nine patchwork pillows for my mama, who also stays up late doing mama stuff. I am loving this fabric from Moda's Urban Indigo line. Its so delicate and sweet. And now I'm going to bed. Goodnight mamas. The beginning of my first crocheted blanket. Thanks to my friend Jennifer ;) I learned how to do the double chain stitch. 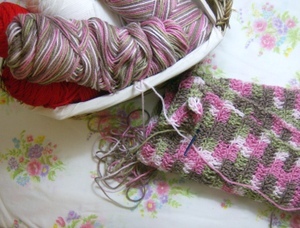 Once I got the hang of it I couldn’t stop and what was meant to be a scarf is on its way to becoming a blanket. And this is one going to be the top of my first quilt. I'm using charm squares again (I love those little guys) from Moda's Chocalot line. Not much further to go on this one. Hello to all. My name is Heather. I've been reading craft blogs for about a year now and finally decided to jump in. I have been so inspired and I only hope I can create a blog that others can be inspired by too. Also, I have a busy life and I think this blog will help me to document the wondrous moments that I would otherwise miss. 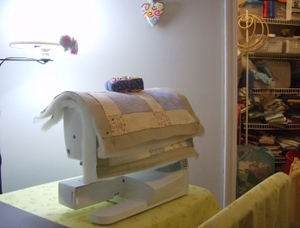 I also love to sew and would like to share that with others who love it. These are my most recent sewing projects. 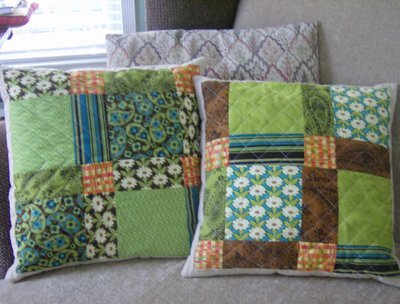 Pillow covers using the disappearing nine block. I uses charm squares from Hancock of Paduca. I have been working my to making a whole quilt but for now I just quilt small things. Sorry about the poor picture quality, it looked much clearer on the camera I promise.